If you’re going camping with a large group of people, one of the most comfortable things you can bring along is the best cabin style tent. The right one will have enough room for everyone, keep you dry, and maybe even offer a little bit of privacy. We researched some of the best-selling products out there to find out which ones really are the best. Before we get into our picks for best waterproof cabin tent, let’s look at some key features. 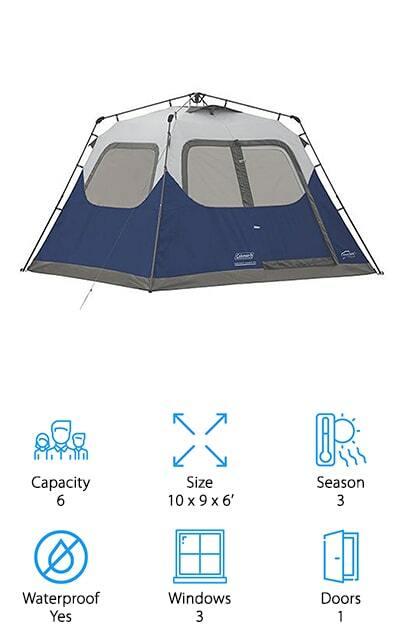 Capacity: This will tell you how many adults can fit comfortably into the tent. While some of these tents are large enough for multiple air mattresses, keep in mind that capacity is based on people using sleeping bags. Size: The dimensions will tell you a lot about how much floor space you’ll actually have. Another important thing to pay attention to is the height, especially if you or members of your family are exceptionally tall. Season: Most of these are 3 season tents, meaning they’re safe for spring, summer, and fall. Obviously, winter camping has different needs. We did find a tent rated for year-round, just be sure to take the proper precautions in cold weather. Waterproof: Some of these tents are properly waterproof. No water will get in anywhere, not the roof, walls, or floor. The tents that aren’t are water resistant, which is a little different but still a good choice for camping in dry weather. Windows: Not only do windows give you a great view of the wilderness, but they are also one of the main ways to make sure your tent is properly ventilated. They let in more light, too. Basically, the more windows, the better. Doors: If you have a large tent that has a lot of rooms, having more than one door just makes things more convenient. 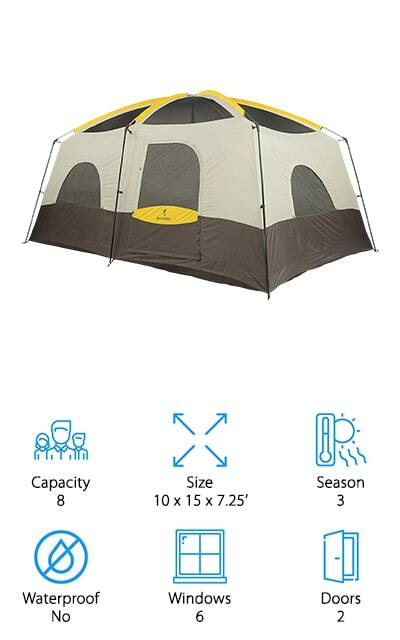 Imagine if you had a tent with 16 people in it all trying to use the same door. Now that you know a little more about what to look for, let’s move right into the top rated cabin tents. Here’s how it works. We put out top and budget picks right at the top of the list so that you can see the range of products available, even if you’re in a hurry. Honestly, though, all of these tents are great and they’re all very, very different so stick around if you can. Ready? Let’s go! First up is the bbCORE Instant Cabin Tent, our top pick for best cabin tents for camping. There’s a lot to love about this tent. First of all, the large floor plan can sleep up to 9 adults in sleeping bags and still have room left over for gear. It features an optional room divider and plenty of storage pockets to keep things nice and neat. The venting is truly special, drawing cool air in through adjustable intake vents and letting hot air escape through the large mesh ceiling. It includes an adjustable rain fly that attaches with extra wide, thick tape that’s heat sealed to keep water out. When the rain fly is removed, the top of the tent provides amazing views of the surroundings, perfect for sleeping under a starry night sky. For one of the best rated cabin tents on a budget, check out the Coleman Instant Cabin, an easy to set up tent that sleeps 6 people. The poles are actually pre-attached so all you have to do is extend them and secure them in place, taking setup time down to as little as 60 seconds. This tent features an integrated rainfly, welded floors, and inverted seams that keep water out. There are also 2 storage pockets to help you keep your gear organized. Another cool thing about this tent is its darkroom technology. It actually blocks about 90% of the sunlight coming into the tent which not only lets you get some sleep during the day, it also keeps the tent just a little bit cooler on those hot, sunny days. If you go camping with a large group, you already know the benefits of cabin tents with rooms. 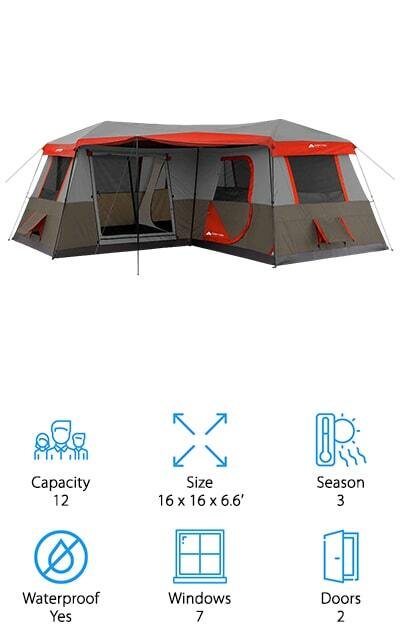 The Browning Camping Big Horn Tent does, too, which is why the extra tall center, straight walls, and wall divider are designed to maximize privacy and space. 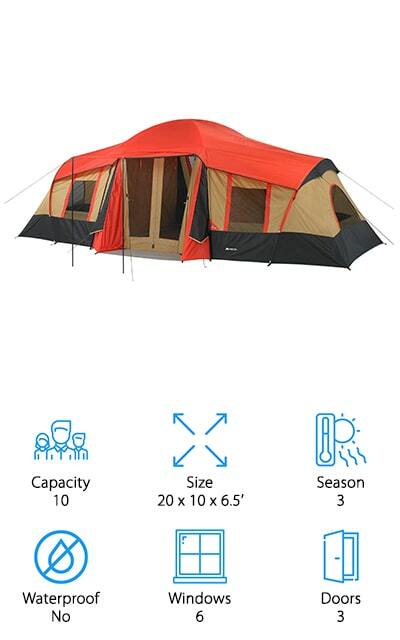 This tent can sleep 8 adults and features 2 large doorways and 6 different windows. Each door has a protective awning over it and the fly and floor seams are factory sealed to keep water out. That’s not all, the mesh roof also adds additional ventilation and a great view of the stars. That’s not all, it also includes mesh storage pockets, a polyester rain fly, guy ropes, and steel stakes for quick and easy setup. The freestanding hub design uses fiberglass poles and steel uprights so it’s extra sturdy. Another great tent for camping with a large group of family and friends is the Wenzel Klondike Tent. 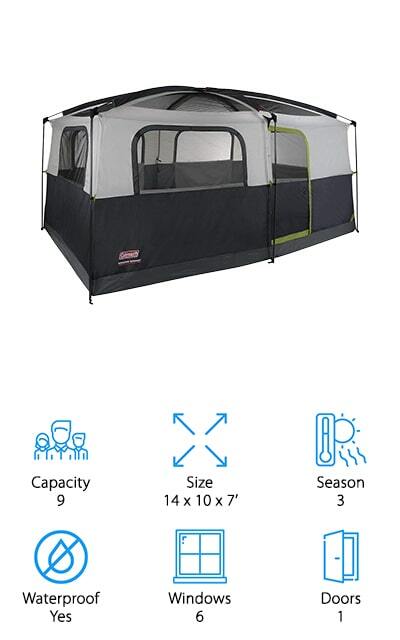 Not only does this tent have a main room large enough for 5 adults, but it also has a front “porch” area that’s screened in and has an overhead awning, providing protection from insects and the elements. This also gives you an area where you can dry off or take off your shoes before entering the main tent. Plus, the porch area has enough space to sleep 3 people comfortably. 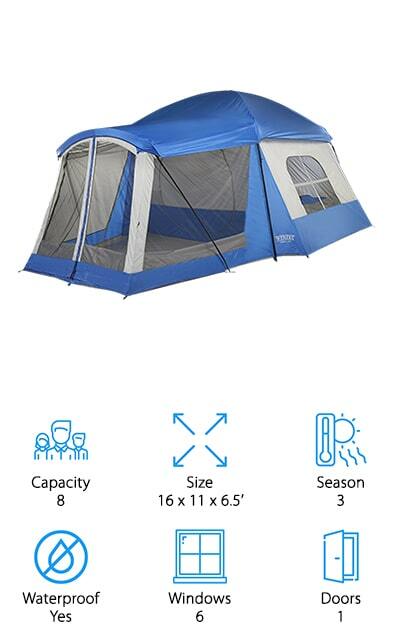 This tent features 1 door, 2 large windows, and a mesh roof. There’s a gear loft to keep the floor space clear and a rain fly is included. There’s also a rear mesh vent that lets ground air in to help with air circulation and getting hot air out. Another one of the top cabin tents on the market is this Trail Family Cabin Tent from OZARK. 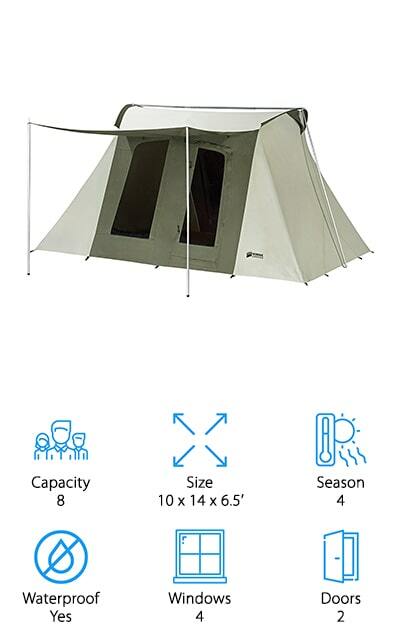 This tent can sleep up to 10 people. It can actually be divided into 3 different rooms using the included room dividers to provide some privacy and personal space. One of the great things about this tent is the easy access. There are 3 doors total, one in the center and one at each end so each of the 3 rooms can be accessed independently. This is super convenient but also offers even more privacy. It can fit 3 queen-sized mattresses with room to spare. That’s not all, it even comes with a queen-size and twin air mattress so you and your family can get your adventures started right away. One of the best canvas cabin tents available is this one from Kodiak, the Flex-Bow Deluxe. For one thing, it can sleep up to 8 people comfortably. It’s made with 100% cotton duck canvas that’s durable, waterproof, and breathable. The material has been treated with silicone dry-finish that will keep campers dry, even in a downpour. There are 2 large D-shaped doors and 4 large mesh windows that don’t allow people to see in to maintain privacy. That’s not all, there are also 2 funnel-flow vents that help bring in cooler ground air, circulating the hot air out of the tent for improved airflow and temperature control. The floor is made of reinforced vinyl plus there are a gear loft and plenty of pockets for storage. One more thing, it’s designed for year-round use. The Coleman Prairie Breeze Cabin Tent is up next. It has 140 square feet of living space. That’s enough room for 2 queen-size air mattresses or 9 people with sleeping bags. One of the great things about this tent is it has a lot of ventilation. What exactly do we mean? In addition to the 6 mesh windows, there’s also a built-in 2-speed fan that really helps keep the air flowing or can work to expel hot air out. Plus, the fan also has a small LED light that’s much more convenient than hanging a lantern for illumination. The seams on the main fly are factory sealed and welded to keep out any water. And that’s not all, the floors are also made using welding-inspired technology for added strength and waterproofing. If you’ve been on the lookout for extra large cabin tents, your search is over. The Tahoe Gear Ozark Cabin Tent can sleep up to 16 people, perfect for really large groups or large family trips. This tent is really easy to assemble using simple shock-corded poles and a pin-and-ring system that goes together really quickly. It features a water-resistant polyester fly with taped seams and a durable polyethylene floor. There’s also a canopy that extends over the door for a little bit of extra coverage. The ventilation on this tent is great. 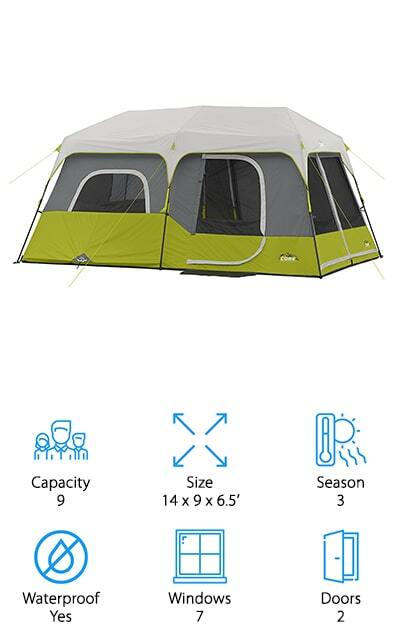 With 6 large windows and floor vents, you get some great cross-ventilation that keeps the air moving throughout the tent. This tent is divided into 3 different rooms with large openings, though they can be zipped close for more privacy. One of the best things about the Ozark Trail 3-Room Cabin Tent is the layout. What do we mean? Rather than being set up as a large square, the tent itself has an L-shape. This naturally creates different rooms inside the tent. Outside, there’s an extendable awning that makes the section between the legs of the L-shape into a perfect porch area. This tent has enough room for 3 queen-size air mattresses and can sleep up to 12 adults comfortably. There are 7 windows that really help with ventilation and the fully taped factory sealed seams keep water out. Setup is really easy, too, because the poles are already attached. One more thing, it also features a large ground vent that is large enough to fit an air conditioner if needed. Last but not least is the Timber Ridge Cabin Tent, a nice choice for groups of up to 6 people. 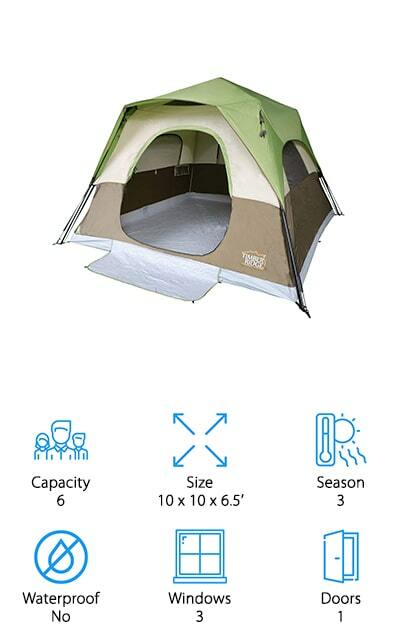 This tent has a large, front O-shaped door for easy entrance as well as 3 large mesh windows. 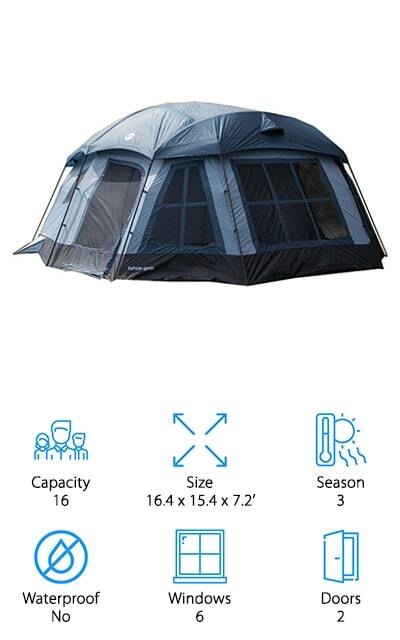 You get a lot of ventilation with this tent which helps keep the temperature pretty comfortable, even on warmer days. There are additional vents on the ceiling and an included rainfly to help keep things dry if it rains. Setup is insanely easy. The quick open system can be up and ready to go in less than a minute. When you’re done, collapsing the tent is fast and there’s a carry bag included for easy transport. One more thing, there’s also a port for electrical cord access that can be closed off if not needed.